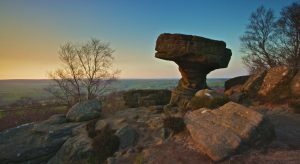 Amazing collection of weird and wonderful rock formations scattered over 50 acres of moorland, which you can explore via a labyrinth of paths. Owned by the National Trust, facilities include a visitor centre, shop and refreshment kiosk. Some paths are suitable for wheelchair users. 17Opening times: Rocks – daily (8am to dusk) all year. Visitor Centre and refreshment kiosk – daily 11am to 5pm from 28/5 to 2/10. Weekends, bank holidays and local school holidays from Oct to May.